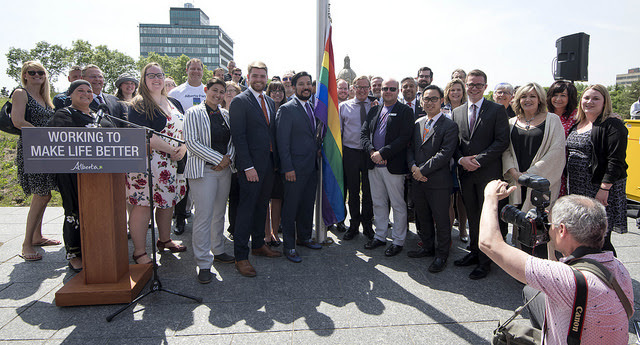 “I am honoured to raise the Pride flag to celebrate and reflect on Pride Month. For the month of June, the Pride flag will fly as a symbol to the world that our government proudly stands with LGBTQ2S+ Albertans and will keep fighting for and protecting their rights and freedoms. “Under Premier Notley’s leadership, we have taken historic steps to create a more inclusive and welcoming province. I am so proud to be a part of a government that has three openly gay MLAs, and to serve as a cabinet minister. “However, members of the LGBTQ2S+ community still face fear, hatred, violence and discrimination today. Opponents of equality rights here at home have gotten louder. And while some pander to extreme special interest groups, our government is unwavering in our commitment to stand up for the rights of the LGBTQ2S+ community and continues to build a welcoming, inclusive and safe province for everyone. 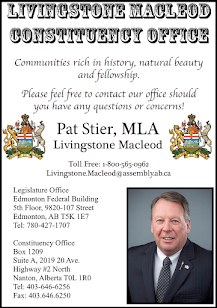 “This year, I have the tremendous honour of being a grand marshal along with my colleagues, MLAs Estefania Cortes-Vargas and Michael Connelly, for the Edmonton Pride Parade on June 9. We will be joining over 30 other grand marshals who have been pioneers, trailblazers and leaders in the LGBTQ2S+ community. “I invite all Albertans to join us, Premier Notley and our government colleagues to march loud and proud in support of the LGBTQ2S+ community. I also encourage you to check out the many pride events across the province during Pride Month.